I started this blog feeling like this. And here I am again. They don’t want to hear what I have to say. I say it in a warm way – perhaps you can try… this might be a good idea… How about…? Only to be told they have a better way. A tried and tested way. A way that they’ve been using for years and years. But one that has failed them again and again. They say we need to shake things up this year. So I tell them straight this won’t work anymore… You need to do … Can you please… Only to be ignored once more. Told there’s a reason we don’t to it like that. But I know I’m right. I’ve spoken to the people they’re trying to appeal to. I’ve watched them from the outside, failing, and I can see where they went wrong. And now they’ve shipped me off. P.S. You’re on this team now. Like I am labour to be moved. Like my opinion on what I choose to do with my free time and energy counts for nothing. The troublesome woman who keeps asking about deadlines and roles. The troublesome woman who bothers asking if this is worth it. The troublesome woman who tries to get others involved. They need volunteers. But what they really mean is bodies not minds. Once again they’ve thrown away someone willing to give it their all. And then they wonder why it’s the same people in the room year after year. I know I don’t belong. But I know I deserve to. And yes it’s their loss. But here I am feeling lost. I turn a minute older. And just like that I am a whole year wiser. Yesterday started with me feeling unwell. Colouring to clear the cobwebs clouding up my mind. It ended with me arguing with my mum. She hurt me deep. But then she offered me an olive branch and I snapped it in two. I start of this year alone and confused. I can only pray it will go up from here. Happy birthday day to me. My birthday wish is to find contentment in myself – in my choices, in the way the world is heading and in the people I have around me. I watched In time recently – a film set in the dystopian future – where currency is time. I can’t say I enjoyed the film very much but the concept was an interesting one. The film touched on many themes – capitalism, greed, the idea of what living truly means. Now I can’t say that I understand capitalism well enough to give a coherent criticism and I do work in the corporate world so that would be somewhat hypocritical of me. But one thing idea that did linger in my mind is the morality of killing a few to save the many. Immediately I am sure we would all say no, that is wrong. All lives matter. 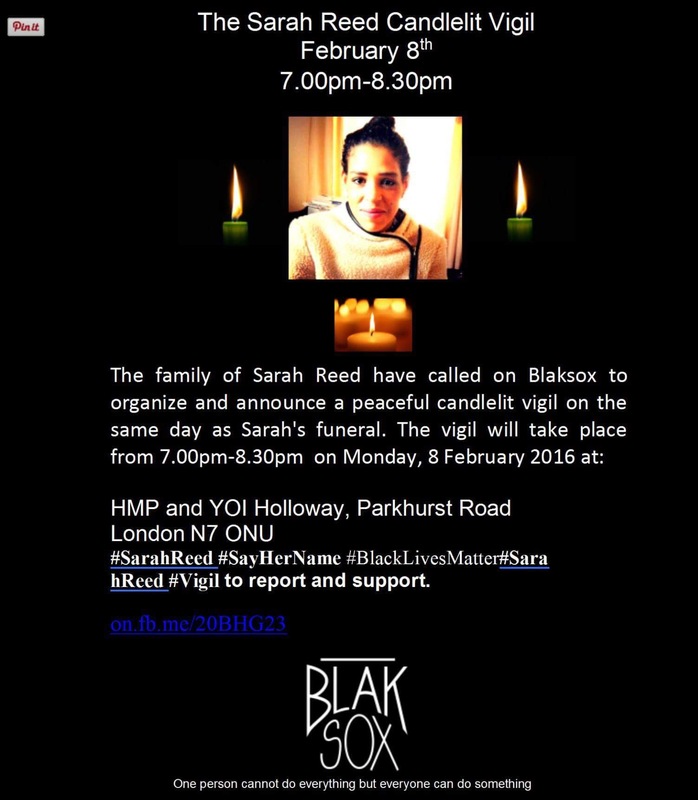 The family of Sareh Reed have called on Blaksox to organise and announce a peaceful candlelit vigil on the same day as Sarah’s funeral. The vigil will take place from 7-8.30 PM on Monday 8th February (tomorrow) at HMP and YOI Holloway, Parkhurst Road, London N7 ONU. Please share and attend if you are able. This is happening here – not the US. Police brutality and violence in the hands of the state cannot keep going. How many more lives stolen before we wake up? 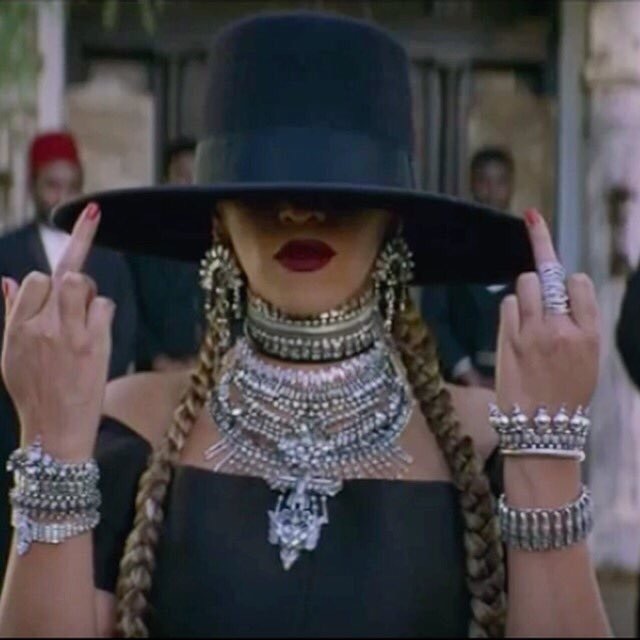 I have been watching and listening to Beyonce’s new video – Formation – all day. 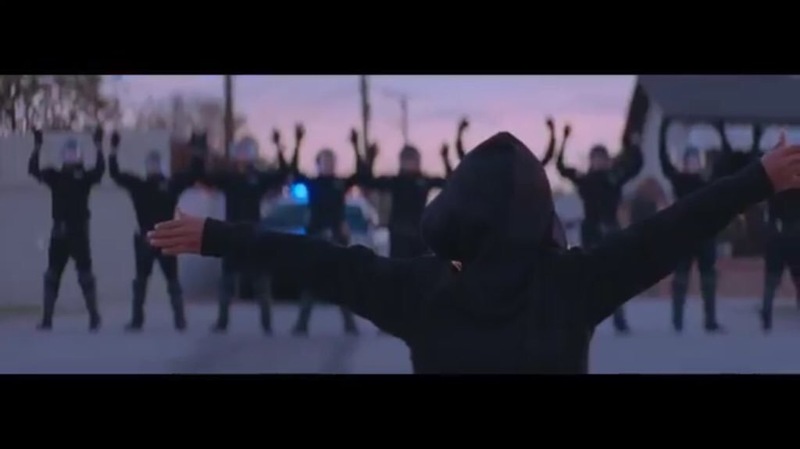 Her politically woke video shows images of her daughter rocking her afro, a wall with “stop shooting us”, her lying on top of a sinking New Orleans police cruiser, a black child dancing in front of riot police and them putting their hands up, a man holding a newspaper called “The Truth” with Martin Luther King Jr. on the front page captioned “more than a dreamer”. Damn. And that’s just the video. Her words speak about black positivity and send messages of owning and loving blackness. The Queen has done it again. Slay. Music has the ability to inspire and empower. As a non-black person of colour, I cannot sufficiently explain the importance of this message to black people having to survive racism so I will leave others better equipped to comment on this. But I am excited at the fact that mainstream music is highlighting the problems. Historically – music has been an important tool in political warfare. Joining hands with social media, the potential to connect globally, demonstrate realities and remove the need for mainstream media channels – this once again has people talking about violence at the hands of the state. And that in itself is a powerful thing. Self-care is an act of political warfare. Learn to share only when you have the strength to do so. Say no when you do not. Say nothing when even this is not possible. Our pain matters. Our words are worth something. Our experience is real. We are not exotic. We are not submissive or unduly angry. We are not different to the others. There is a difference between offensive and oppressive. And we know when we are being oppressed. By their words, by their actions, by their systems. We can recognise the dull pain it causes deep in our stomach. And so we do not have to explain it. Not why we do what we do. Not why we want what we want. And certainly not when we hurt the way we do. I met another man yesterday. He was … nice. There is really nothing much more to say about him. I asked whether he reads – he said no. I asked whether he did anything outside of work – he said no. I asked whether he has any plans in life – he said no. He is just very content with where he is right now. And at first I was bored. Bored of listening, and bored at even imagining how boring his life would be. That was yesterday. Today I wonder whether he has something I don’t have – content. I am close to 25 and nowhere near satisfied with what I am doing, how much I know, who I am surrounded by. I still push myself to explore new areas and develop old skills. He is closer to 30 and I wonder if at a point – different points for different people – we just stop wanting more and just start living with what we have. And would reaching that point show an abundance of peace or lack of drive. I did not know him before yesterday so I do not know if he ever had hope and dreams to be more than he is now. Or of course whether those were to reach where he is now. I wonder if I will ever get to where I want to be – first step of course being figuring out what that is. And if I ever did get there (wherever and whatever that may be), would I move the prize a little further away? I guess I know what I want the answer to be. I never want to be satisfied. I want to keep pushing myself, to never settle. And for the time being, I remain single. “if someone does not want me it is not the end of the world. but if i do not want me. the world is nothing but endings.” ― Nayyirah Waheed, salt.